Small businesses contribute greatly to economic growth in both developed and developing markets(1). In the Organisation for Economic Co-operation and Development (OECD) member countries, young SMMEs generated 42% of new jobs, on average, between 2001 and 2011, and they are more likely to employ unskilled and younger workers than larger firms, helping to reduce existing inequalities(2). In South Africa, research shows that the number of SMMEs ranges from 2 251 821(3) to 5 979 510(4). This extensive range is indicative of the large informal sector in this country, since these estimates include both formally registered and informal small businesses(4). SMMEs in South Africa contribute 42% to Gross Domestic Product or GDP(3) and employ up to 11.6 million individuals(4). The majority of independent start-ups begin very small and remain 1-to-3-person entities throughout their existence(5). A study by The Finmark Trust (2010) confirms that 67% of SMMEs in South Africa do not create employment for anyone other than the owner of the SMME, while only 6% of SMMEs surveyed employs more than 5 individuals(4). Even though small businesses providing employment for only 1 to 3 individuals do not instigate growth, it is recognised that those businesses contribute to maintaining economic stability(5). The South African government recognises the importance of small enterprises. The government established the Ministry of Small Business Development in 2014(6) and implemented the Amended Codes of Good Practice (COGP), where great emphasis is placed on small business development(7). South Africa's National Development Plan (NDP) aims to create 90% new jobs through small firms by 2030(4). There are also various government and private sector initiatives that aim to develop small businesses, such as The Small Enterprise Foundation or SEF, who began lending to small businesses in 1992 and, by 2013, had 100 000 active loans(4). Entrepreneurship carries two dimensions: the presence of lucrative opportunities as well as the presence of enterprising individuals. This combination is a mechanism that drives innovation in the delivery of products and processes - crucial for driving economic growth(8). Even with all the institutional support to small businesses in South Africa, 75% of new SMMEs created in South Africa fail within the first two years of operation(10). Given the potential impact that small business growth has on economic growth, the high failure rate of SMMEs - despite seemingly strong institutional support in South Africa - warrants further investigation. In Parts 2 and 3 of this series, Olivier will look at the formal institutional enablers of finance and education to gain more insight into their impact on small businesses in South Africa. Article by Cornelia Olivier, Head of Sourcing: Corporate Services, Absa. To find out more about the study conducted, please contact the author on LinkedIn. (1)Ngek, N.B. & Van Aardt-Smit, A. (2013). Will promoting more typical SME start-ups increase job creation in South Africa? African Journal of Business Management, 7(31), pp. 3043-3051. (2)OECD. (2015). Economic surveys South Africa overview. Available: http://www.oecd.org/South Africa. (Accessed 12 March 2017). (3)The Small Enterprise Development Agency. (2016). 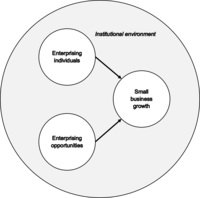 The small, medium and micro enterprise sector of South Africa Research Note 1. Stellenbosch: University of Stellenbosch. (4)Finmark Trust and the Centre for Microfinance. (2010). A review of the South African microfinance sector 2009. Pretoria: University of Pretoria. (5)Davidsson, P., Delmar, F. & Wiklund, J. (2006). Entrepreneurship and the growth of firms. Cheltenham: Edward Elgar Publishing Limited. (6)Finmark Trust. (2015). Financial access and SME size in South Africa. Pretoria: University of South Africa. (7)The Department of Trade and Industry. (2015). Broad Based Black Economic Empowerment Amended Codes of Good Practice. Available: https://www.thedti.gov.za/economic_empowerment/bee_codes.jsp. (Accessed 28 October 2016). (8)Shane, S. & Venkataraman, S. (2000). The promise of entrepreneurship as a field of research. Academy of Management Review, 25(1), pp. 217-226. (9)Acs, Z.J. (2015). Global entrepreneurship, institutions and incentives. Cheltenham: Edward Elgar Publishing. (10)Fatoki, O.O. & Odeyemi, A. (2010). Which new small and medium enterprises in South Africa have access to bank credit? International Journal of Business Management, 5(10), pp. 128-136.